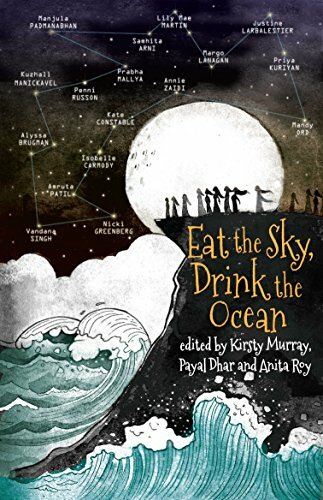 Imagined in the wake of violent, well-publicized attacks on young women in India and Australia at the end of 2012, Eat the Sky, Drink the Ocean is a path-breaking anthology of twenty feminist speculative fiction stories that brings together authors, artists, and editors from both those countries. "Bringing together" here does not just mean that the contributors share space in the anthology; rather, editors Kirsty Murray, Payal Dhar, and Anita Roy paired contributors from each country off with each other and gave them the directive to collaborate. The results are wide-ranging—the anthology contains no less than six graphic stories, as well as a play script, alongside the more usual short stories—but eminently sensible for a book whose scope extends far beyond its brief. Though grounded in India and Australia, Eat the Sky, Drink the Ocean resonates globally, both through the common causes of its stories' concerns and through the brilliance of those contributions. The vagaries and biases of world publishing meant that many of the names of Australian authors in this anthology were familiar to me, but that most of the Indian contributors were complete unknowns. If it only introduced these writers to a wider audience, Eat the Sky, Drink the Ocean would be worth the time for that alone, but it does much, much more than that. Indeed, collaboration is the anthology's greatest strength, both in terms of its groundbreaking methodology—some of the collaborators had never met before they began working together, and/or only worked together online—and in terms of its content. Many of the stories, including some of the strongest in the anthology, revolve around girls and young women finding that they are not alone, going from individuals struggling against seemingly insurmountable social obstacles to one of many people working together towards a shared goal—and finding that in that solidarity, they can accomplish more than they had previously imagined. As a feminist and a researcher, I find the SFF genre cliché of the lone rebel achieving a total revolution (often in just one trilogy) doubly aggravating; many of the stories in Eat the Sky, Drink the Ocean are a welcome pushback against that trope, showcasing not just the social but the literary power of collective action. It is, in fact, possible to write good speculative fiction about the hard, grinding process of working towards social change. One of the collection's stand-outs, Margo Lanagan's unflinching "Cat Calls," eloquently conveys the difficulty and terror of standing up to street harassment, but also—drawing on Lanagan's research into current movements aimed at combatting it—perfectly illustrates the triumph even a small victory can bring when people work together. Writing speculative fiction can itself be part of the process of social change, of course. It's not an exaggeration to say that Eat the Sky, Drink the Ocean may be the most feminist short fiction collection I've read since Joanna Russ's The Zanzibar Cat, which may be a sign that I need to read more anthologies, but is certainly a compliment to the editors' and contributors' principles. As if to disprove the stereotype of the joyless feminist, however, those principles are gently and deftly woven throughout the anthology, which is not short of magic and even romance, yet is also remarkable for shining a light on aspects of life that aren't usually depicted in speculative fiction. Ironically, it's precisely that clear-eyed commitment to feminism, particularly eco-feminism, that makes for some dark tales and rough going at times. Samhita Arni's "Cast Out," for example, a powerful story in which the most despised girls in a post-apocalyptic society create their own community in resistance, necessarily starts from those grim conditions. Even as the narrator's horizons expand, neither she nor the reader can forget the other girls and women still left behind, allegedly free but in reality shackled by society. Many of the speculative stories take place in the quite-probably-not-so-distant-future when the Earth has been ruined by climate change, unchecked capitalism, and environmental collapse, even if that fact is often conveyed to the reader as a gentle twist rather than stated upfront. "It cost so much to produce these sacred treasures—in oil, in energy burned, in forests destroyed," muses the unnamed narrator of the opening story, Kate Constable and Priya Kuriyan's "Swallow the Moon," gazing upon tiny petrochemical doodads salvaged from a drowned city. "These things must have been much loved, and filled with power, to be worth the sacrifice of a whole world." Justine Larbalestier's acid-etched retelling of "Little Red Riding Hood," "Little Red Suit," is set in the underground remnants of what used to be Sydney, before the seasons failed and the waters rose and the rain stopped: in the claustrophobia of a kludgey environmental suit, in a classist and sexist society that is literally airless, the menace of the wolf is almost refreshingly straightforward. Still other stories imagine other worlds facing other kinds of oppression, as in Kuzhali Manickavel and Lily Mae Martin's melancholy "The Wednesday Room," in which the last girl able to see supernatural creatures studies for an exam which will expunge her abilities entirely. Indeed, by the end of the book I was more than a little depressed: if these artists can't imagine a future in which the world isn't ruined, in which one gender isn't wildly unequal, then what hope is there for averting such possibilities in the present? But a little more brooding, and rereading some of the strongest stories in the collection, made me realize that I was in danger of missing the forest for the trees, and the point of the anthology itself (both of them): like the song says, every act of creation is an act of faith, and in creating these stories, the authors are expressing not despair but hope, not a lament but a call to action. "My mother's last scientific act," the protagonist of Vandana Singh's stellar "Arctic Light" thinks, looking at a weather-beaten topographical marker: "the stake in the ground, the declaring of a boundary, a catastrophe, a limit. But also, maybe, a gauntlet." "‘I know,' she said, ‘we are not a sweet, silver Device that fits in the palm of your hand—we are a big messy Device with lots of loose parts coming and going. But we don't cost anything, and we don't need a battery. And when we do work, we're much more fun.'" I know all about the Chronologic, I know it can't be changed, but I asked myself why? Why can't we change history? . . . Maybe I can't change anything—but I know I've got to try. Perhaps if people know what life will be like without the bees, they'll be able to do something about it. I don't know. All I do know is that I want to live my life—and if I can't cook real food, I might survive, but I think I'll die. Eat the Sky, Drink the Ocean is a raw, powerful device with some loose parts, but above all, a lot of wit and heart—and real food for its readers' wits and hearts as well. Electra Pritchett lives in Tokyo, where she splits her time between reading, research, and her obsession with birds and parfait. She blogs at electra.dreamwidth.org.